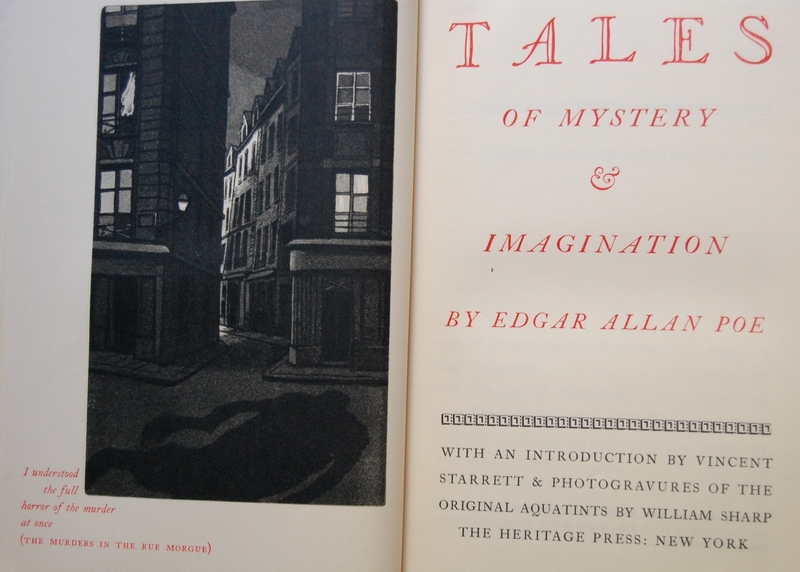 The second “Outside the Macy Sphere” book post is on Random House’s exquisite 1944 issuing of Edgar Allan Poe’s Tales of Mystery and Imagination, here simply titled Tales of Edgar Allan Poe. 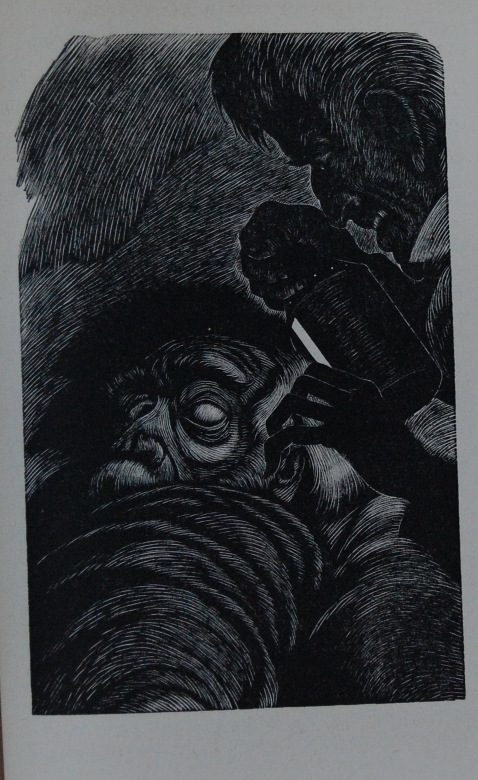 While the mystery and imagination have been exorcised from the title here, Fritz Eichenberg did his best through his woodcuts here to represent those fantastical notions. 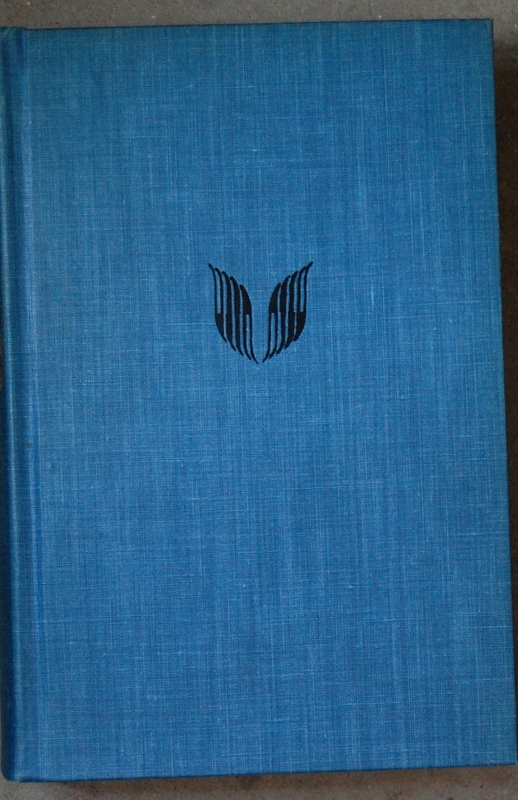 H. Wolff Book Manufacturing Company of New York printed up the work, and Margaret B. Evans served as the designer. Front Binding – This is a nice, medium-sized book that was originally issued with a light blue slipcase, featuring a nice cerulean (if I’m mistaken, I apologize; I’m unfortunately quite familiar with the Crayola color wheel :0 ) fabric with black and gold stamps for the spine (as you’ll see below). 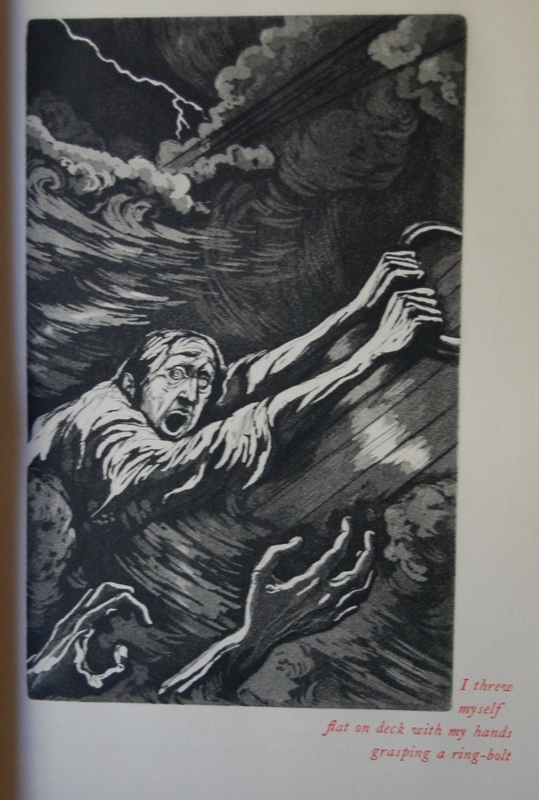 Title Page – Harvey Allen introduces the work, and, of course, Mr. Eichenberg serves up several woodcut illustrations that spice up most of the tales. He did one per tale from what I’ve noticed. Unfortunately, I do not have as many crisp shots as I would like for this post; only four of the six turned out really well, so I’ll likely add in a couple more whenever I photograph more books in the future. Each section of tales features this mishmash of imagery from its representative stories. A neat idea. Page 432 – From The Sphinx. Page 504 – From The Tell-Tale Heart. Page 556 – From The Black Cat. For contrast with the Macy publication, see here. Out of the two, I think both William Sharp and Eichenberg bring a chilling tone to their artwork in their own ways. 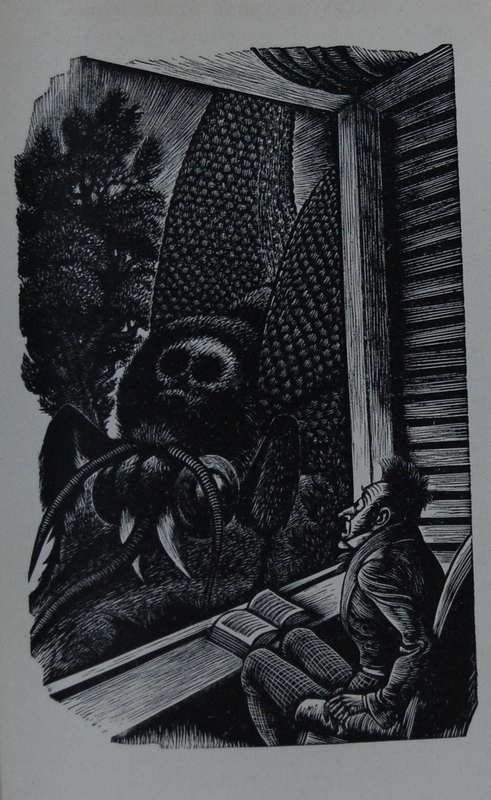 I am quite fond of Eichenberg, as is well stated throughout this blog, but I feel Sharp also grasped the underlying terror and darkness swirling about Poe’s stories. In my opinion, you can’t go wrong with either edition! Front Binding – Two previously featured icons return to the Macy blog today: the author, Edgar Allan Poe, and the artist, William Sharp. We last saw Poe in the exquisite Hugo Steiner-Prag illustrated Poems; I detail out his LEC/HP career in that particular post. Here we have what many would consider his most enduring legacy to literature; his horror-fueled short stories. 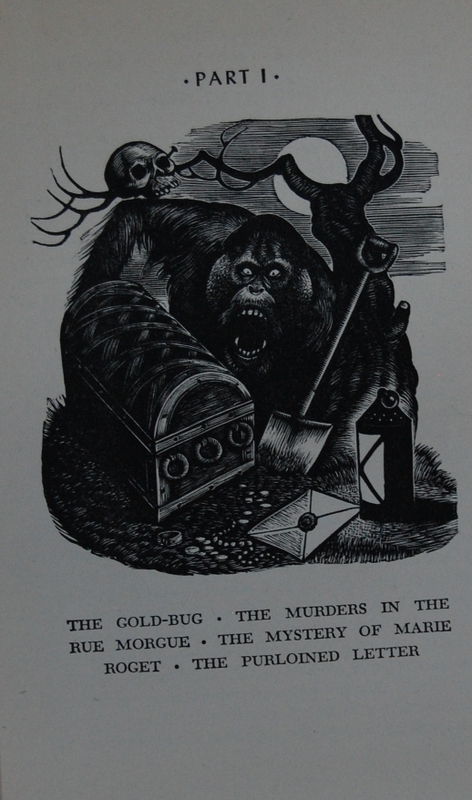 Many of the classics are included here: “The Fall of the House of Usher”, “The Black Cat”, “The Gold-Bug”, “The Pit and the Pendulum”, “The Tell-Tale Heart”, “The Murders in the Rue Morgue”, “The Masque of the Red Death”, and plenty more. 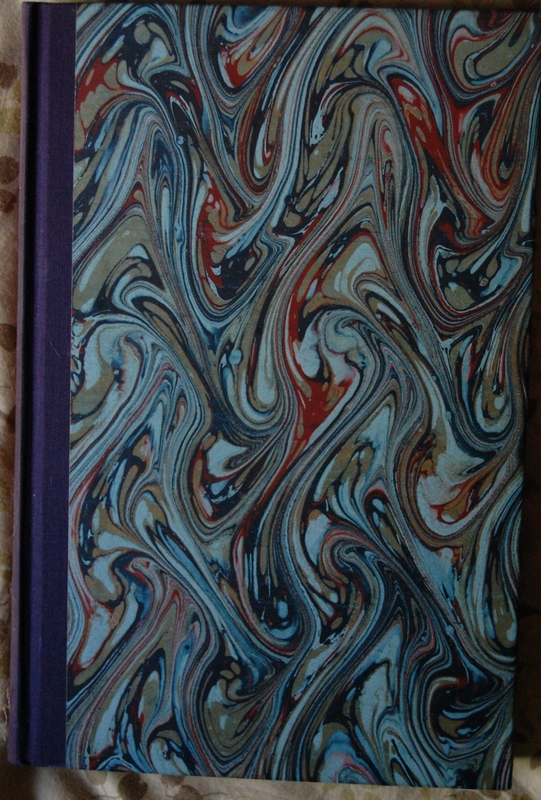 The marbled boards are perfect too; the coloring is ghastly! William Sharp, last spotted doing the set of Samuel Pepys’ Diary, gleefully made his debut for the George Macy Company rendering these chilling tales in 1941. He definitely shows some versatility in his style; his later, more restrained pen drawings for Pepys and Rousseau’s Confessions greatly contrast against these more grisly interpretations of Poe’s imaginative narratives. 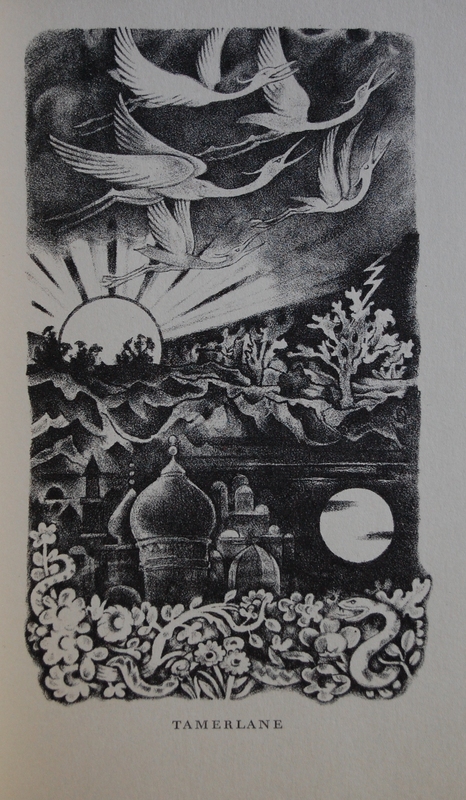 Sharp provided the LEC edition of the book aquatint illustrations, which the Sandglass goes into great detail about. To summarize, the original artwork was done via engraving on a specifically prepared copper plate, and is then dipped in nitric acid to create the print in a watercolor-esque fashion. Photogravures of the originals were utilized for the Heritage edition. Production details: the designer is unstated. 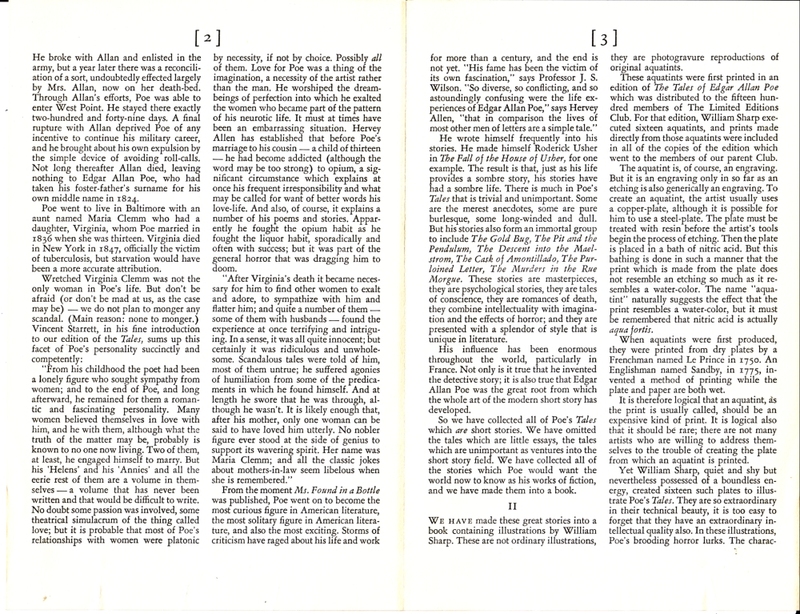 Original Old Style serves as the main text, with English Caslon embellishments and Sylvan decorations. The red ink scattered throughout is called English vermillion. Printing was done by the Riverside Press on Crocker-Burbank Company paper (dubbed “Saturn” paper here). 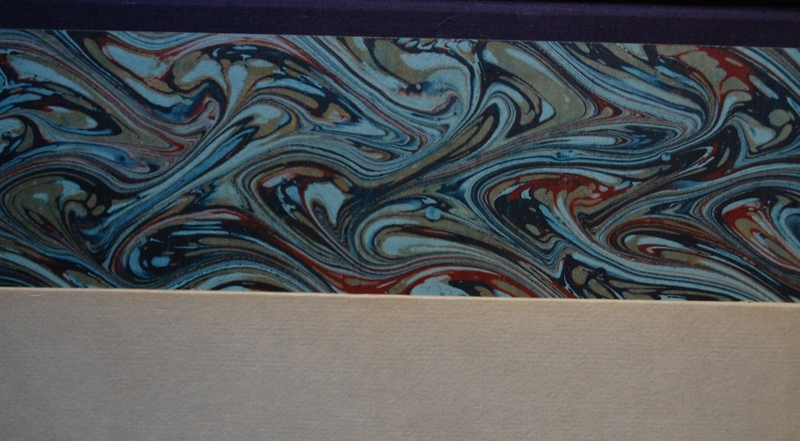 The stunning boards are of the Putois marbled paper family. The spine is gold-stamped. Title Page – Vincent Starrett is the Introductory man for this set of stories. The use of red ink throughout the text is quite lovely. 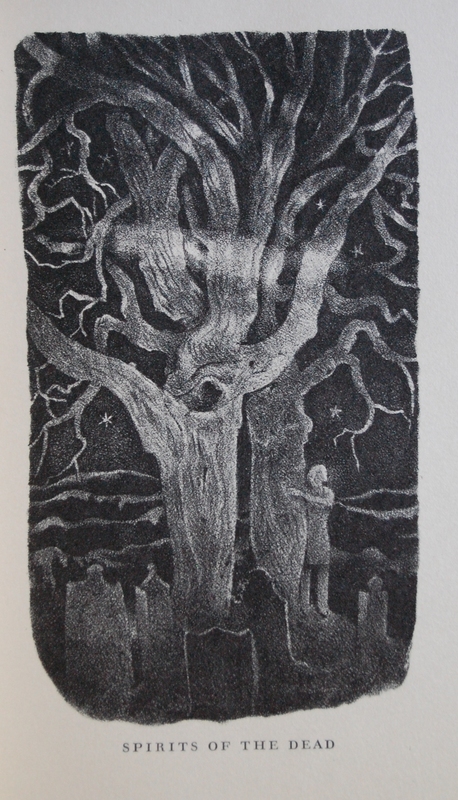 Page 12 – A stark contrast to his historical illustrations in Pepys and Rousseau, Sharp’s morbid aquatints suit the Gothic worlds of Poe’s imagination quite well. Personal Notes – This book came from Carpe Diem Rare Books on my first visit there a few years ago. I paid $15 for it, which is a little more than I usually pay for Heritage titles, but it’s Edgar Allan Poe’s brilliant tales! 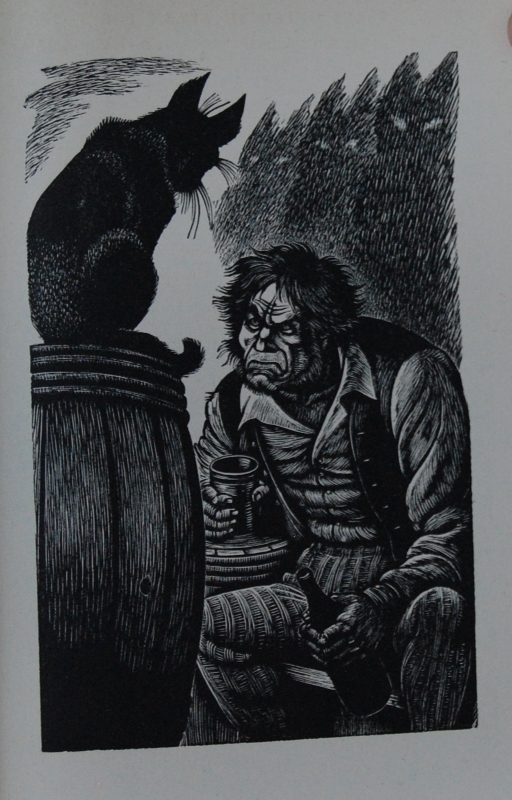 The next book on my Non-Macy tab is the Fritz Eichenberg illustrated Tales; look forward to that! Click images to see a larger view. Front Binding – Welcome to our first American Poets title! There’s quite a few of these, all with the same bland boards on the front and back, saving its creativeness for an patriotic spine (which you can see below). Louis Untermeyer (didn’t I just talk about him?) served as the Editor for this series. 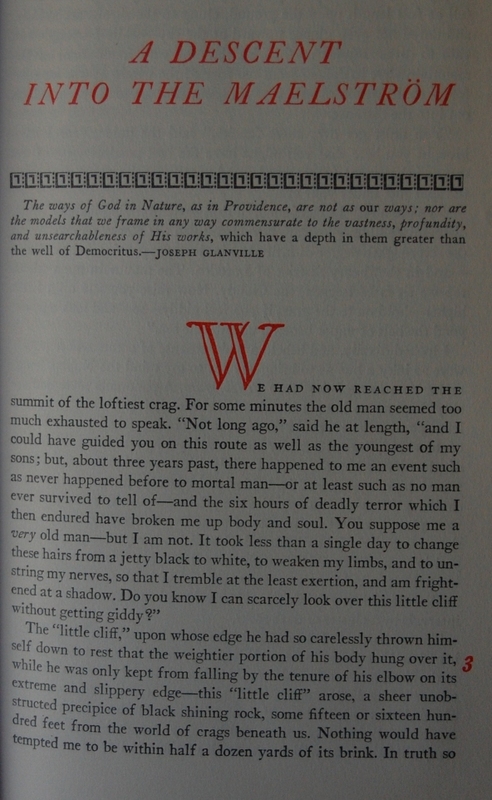 Others include Longfellow, Bryant, Whittier, Dickinson, and Emerson (from a quick ABE Books scan), with Dickinson being the last LEC reprinted in 1952. 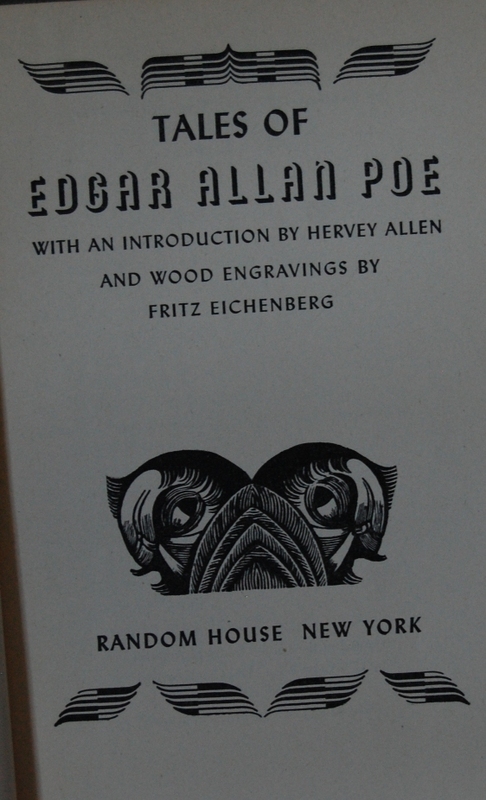 Poe’s was the first, originally done in 1943 by the Limited Editions Club and thus redone by the Heritage Press in this exclusive series. Curiously, they omitted Walt Whitman’s Leaves of Grass despite the collection being among the most reprinted of any of Macy’s books. Anyway, this is our first Edgar Allan Poe post, but there is no shortage of future posts about the Gothic master. 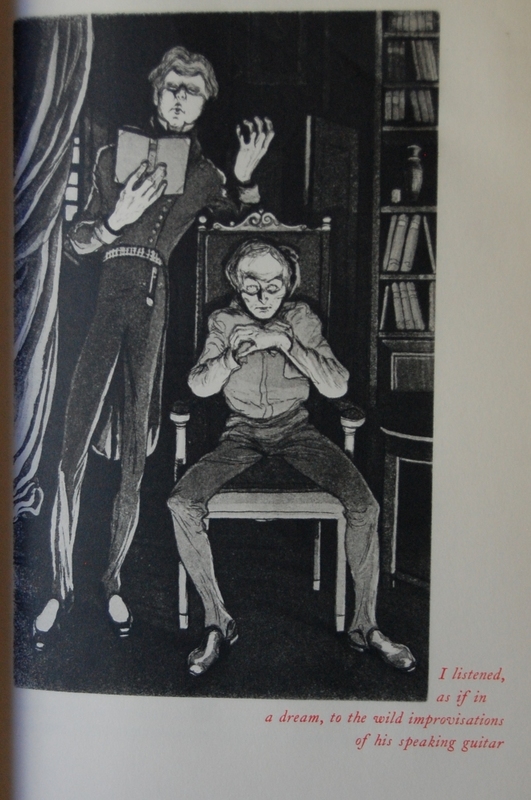 The fifth book the LEC ever produced was Poe’s novel The Narrative of Arthur Gordon Pym (which bizarrely had a Heritage reprint – a scarcity for a book done this early in the LEC lifeline!) in 1929. In 1941 his Tales of Mystery and Imagination would be printed, followed up by this particular book in 1943. With most everything major printed, Macy would retire from Poe’s works, but Sid Shiff revisited The Fall of the House of Usher in 1985 with its own edition. I have Heritage copies of the first two, so expect those down the road. Herr Steiner-Prag has been documented before for his work on Tartuffe – his full career with the George Macy Company is there (and will be revised in the future), but I will add here that this was his last LEC before his passing in 1945. As usual, his work is astounding. Spine – All of the American Poets books have this spine design. 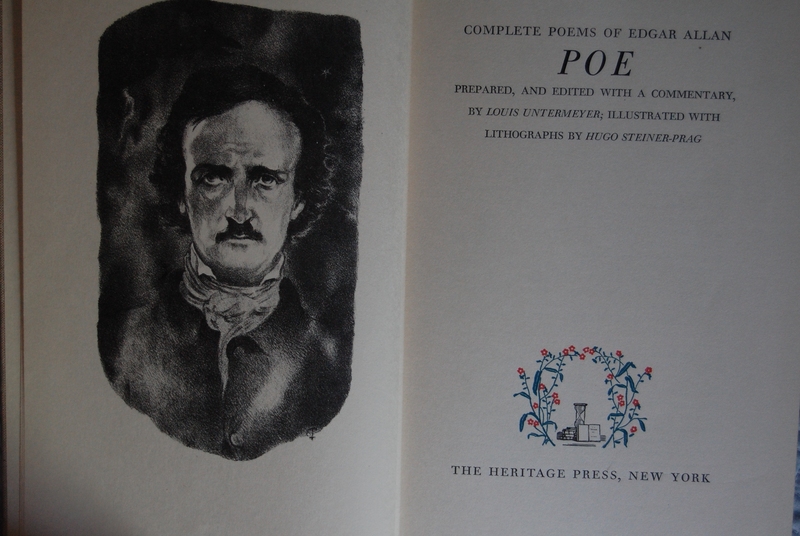 Title Page – Steiner-Prag does a very good Poe portrait, that he does. Untermeyer provides commentary to the poems on top of preparing and editing them, and that is a lovely logo of the Heritage Press Sandglass there! I should scan that for the blog’s Gravatar. Page 11 – A little more surrealist than Tartuffe, but amazing none the less. Personal Notes – I got this one for $5 in Jamestown, California this past summer. 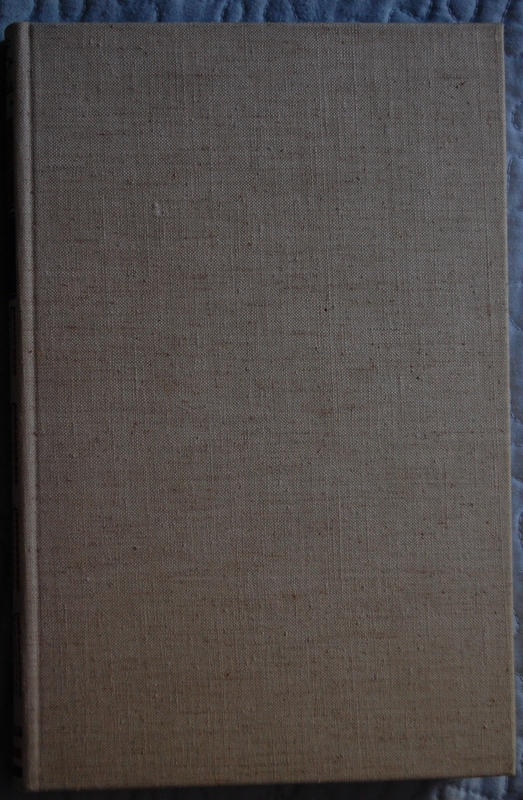 It has no Sandglass or slipcase, but the book was in nigh-perfect condition, and it was $5. I tend to not pass up books that low for documenting!…although I am keeping this one thanks to how nice it is. With any luck I’ll get a slipcase and Sandglass in the future for it. 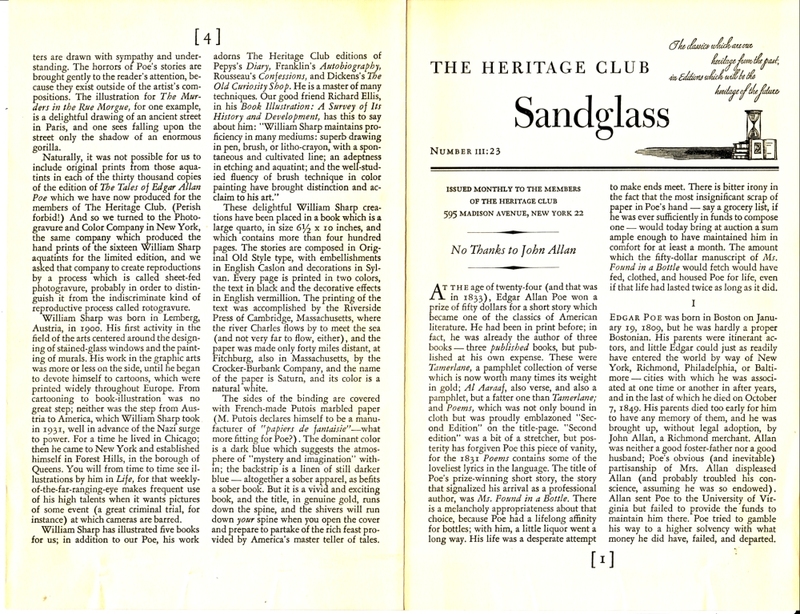 If you have a LEC of this book or a Sandglass for the Heritage New York printing, please drop me a line here or through the comments at my thread about this blog at the George Macy Devotees @ LibraryThing! I could use extra insights into this book. Thanks! You are currently browsing entries tagged with edgar allan poe at The George Macy Imagery.